Audience response systems are a quick, engaging way to pause a lecture and see how well students are understanding the material. Teachers continually search for ways to increase engagement and comprehension in their classrooms. Audience response systems (ARS)—like clickers, for example—can be one tool for achieving those outcomes. ARS have been shown to increase student attendance, exam grades, final grades, attention, and engagement. A major objection to ARS is that the purchase of clickers and accompanying software can be cost-prohibitive. Opting for a free web-based tool like Poll Everywhere is one work-around. 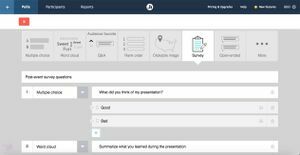 Poll Everywhere allows teachers to construct multiple choice and open-ended questions that can be used to pause a lecture in order to take a quick formative snapshot of how well students are understanding the material. When you present questions to students, it’s through a web browser projected at the front of the class. Student can respond on phones, tablets, or computers. You then have the opportunity to see how many students answered correctly in the case of multiple-choice items, or whether there are any themes in their responses to open-ended items. 1. Teachers get a larger number of responses: In a typical lecture, only a small handful of students will volunteer to answer a question. The remaining students are either embarrassed to answer (“What if I’m wrong?”), don’t know the answer, or are not paying attention. The teacher has no idea what’s brewing in the minds of the students. The anonymity of the responses on Poll Everywhere encourages 100 percent engagement, which naturally increases the number of students who are thinking about the material. 2. Students report that they’re more active and engaged: There’s no risk in thinking about and attempting to answer a question because answers are anonymous. And the questions can break up the monotony of a lecture. A study by L. T. Benjamin Jr. suggests that most people can only focus on a speech for a maximum of 10 to 15 minutes before the mind wanders. If a lecture is broken into 10-minute chunks, followed by a question or two, the change can bring students back to attention. 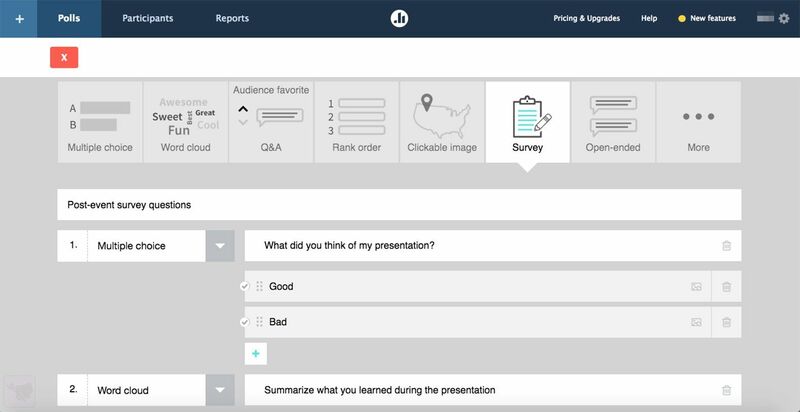 Using Poll Everywhere, teachers can ask students to anonymously answer questions or open-ended prompts. 3. There’s increased motivation to try to understand the material: The students who want to do well will be motivated to grapple with the questions and attempt to answer, in order to get feedback about where they stand. And when students are prompted to answer ARS questions in pairs or small groups, some research shows that the conversations they have are truly on-topic and seriously engaged. 5. Students can use their phones and computers in class: Their precious technology can be seen as enabling learning, not a distraction. Especially if they are used to classroom environments where technology is prohibited, just the act of using devices with teacher approval can be exciting and bring students into the activity. 6. Using questions can do a lot for the teacher: It requires the teacher to prepare the questions, which can center attention on the material and provide insights about how to teach the material in a better way. Using questions also gives the teacher an opportunity to adjust the pace of the class based on how well students seem to be understanding the content. Questions can open up a discussion about why the results turned out the way they did, helping teachers and students think of new examples and applications to make the material more understandable. Using an ARS is not a panacea. Answering questions on a phone is not the same thing as answering deeper questions on an exam. In order to keep students from walking away from class with a false sense of mastery, it’s important for teachers to use the responses to well-constructed ARS questions as a platform for taking the classroom conversation deeper. You can ask a question or two and then ask the students to help you interpret the class responses. Talking out loud with them about what the data say in the aggregate can be a powerful exercise in metacognition.